I have to admit that writing this "Pursuit of Wellness" series has not exactly been pleasurable. 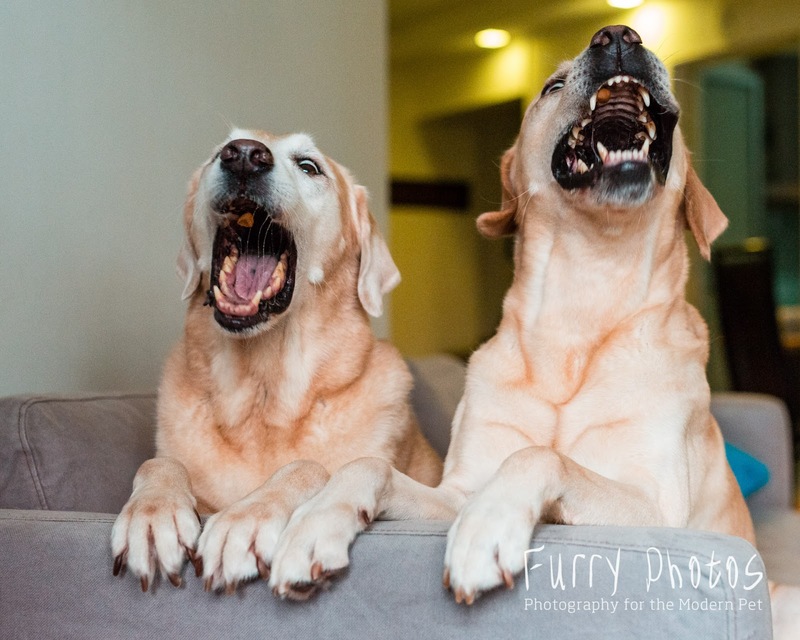 I already miss being the 'ghostwriter' who writes frivolous posts on behalf of Flapper and Frodo. That's a lot more fun and brainless than trying to discuss some "serious" topic. I have been spending hours penning down my thoughts for each topic for this series. Being a brutally honest person who more often than not neglects being 'politically correct', I have to spend a great deal of time typing... then deleting... then typing again... then deleting again.... to find that balance between facts, bias-mama-ism and personal beliefs. Plus one must not forget with the international phenomenon of Dr Google, any thing said or left unsaid could potentially become controversial and cause a backlash - whatever the intention(s) is/are. And why am I rambling on about my reluctance about this series? That is because there are two topics about dog care that I am wildly passionate about that I have always wanted to write but have handcuffed myself against it. And those two topics are - food/eating habits and dog training/behaviour. I am still self-debating about whether to do a part 4 on dog training and behaviour. But in the meantime, thou shalt pen about that cringing topic about food and eating habit. "Food flying down from heaven above into our mouths! GOT.TO.CATCH.IT.!" Before I even begin on talking about the dog food, this eating habit topic is one of biggest pet peeve. I, unfortunately, do not sympathise [at all] when pet owners lament about their pets being "picky eaters". It never fails to amaze me (to a point of disgust) how many pets are "picky eaters". And I "love" it even more when delusional owners tell me, "my dog/cat is very greedy! It eats everything!" I look at the dog, raise my eyebrow and ask, "You sure everything?" I ask the owner, "Soooo.... Does this include dog food"
Owner: "Oh! My dog doesn't like dog food!" I grab some random treat or dog food and offer to the dog. The dog sniffs it intently then ignores it. So what does good eating habit constitute of? It does not matter what is offered to the dog. Even what is deemed as the "worst dog food", the dog will still eat it like it's treasure. Do I mean feeding your dog crap? No. But the point is... the dog will eat whatever that is offered to them, no qualms. And the dog will eat finish its food in one taking like they will never see another meal again = their face stuck into the food and eat finish there and then. I do not even tolerate the dog eating, go walk one round then come back and continue eating. Once the dog steps away, goodbye food. Below is one of my all-time favourite videos of Pebbles' horrendous eating ways that used to drive me nuts and what she is today. She is now very food-driven and because she is way smaller than the boys = she is much closer to the ground = she gets to the food much faster than the boy, she would scuttle at high speed to grab the dropped KIBBLE from below the boys. And why am I such an advocate for good eating habit? If I am going to burn my pocket buying a good quality food, they'd better eat it well. They need proper nutrients going into their system. Balance diet. Good diet. When #2 is in place, it promotes good health. The usual first two thing to go when an animal is sick - their appetite and/or their energy. So for example, one day Flaps had big runs (refer back to the story in part 1). He refused to eat the bread (part of the requirement for the scene) which for Mr Garbage Truck, it was a big indication to me that I had to take him down to the vet. When your pet is greedy and eats like how a dog should eat, any slight change in their food preference can provide valuable information on how they are feeling. And of course, if the pet is rejecting food all together, I call it "dua tai chi". Big problem. Ambulance down to Dr Vet immediately. Whenever people meet Flapper (and Frodo) for the first time, they tend to be pleasantly surprised by the condition of the boys and start asking questions about my care regime. I end up sounding like a broken record. So, to spice this article up a bit, I decided to do compile the list of F.A.Q. before I zoom into talking about THAT 'Pursuit of Wellness'. This will also give a good insight into my feeding philosophies and why until today, the boys are still on dry dog food. Question 1: Flapper (and Frodo) look(s) good! They are so clean! I bet you must really take very good care of them. How often do you shower them? Will you die of shock and disgust if I tell you "they are lucky if they get showered once a month". *grin* *chuckle* *raise left eyebrow. Then I'll add on, "Of course I do splash them down with water and clean them up if they get skunky after an excursion. Have you seen how Flapper rolls in mud and sand? But shampoo..................... once a month if they are lucky." Question 2: Then how come they don't smell? I believe health care is a whole package. Exercise and diet play an important role in maintaining good health. Then of course there's the mental well-being too but that's a totally different story. I think do think the exercise/activities helps a lot. I remember reading this quote from a dog show judge once... something about "a well-exercised dog will have coat that feels good to the touch/hand". Something like that. I can't seem to find that quote anymore. So... either that.... or I just got very lucky that the boys have no smell?!?!?!?! Question 3: So what do you feed your dogs (and cats)? Kibbles. Dog Food. "Biscuit". Commercial food. Whatever name you fancy. Question 4: Do you feed them wet food? Question 5: What brand of dog/cat food do you feed them? Wellness. The Core Original one. The one with chicken and chicken liver. Mister loves liver. They've been on it for years and they are doing very well on it. Question 6: CHICKEN??? They are not allergic to chicken? I heard that many dogs are allergic to chicken. I call this international phenomenon... this allergic to chicken thing - thanks to the internet. I personally do not subscribe to this chicken malarkey. Not that I do not believe dogs can have allergies but it is amazing to see how "allergic" dogs are these days. Let me put it this way. For most (not all, MOST) "highly allergic" dogs that I've seen, are either picky eaters with poor eating habits and/or inactive lifestyle. Bouncing around at home does not constitute as active lifestyle. I'm dying to run a clinical trial on the correlation between picky eaters and allergies but erm well, that's another thing all together. I strongly believe in good eating habits, good diet and exercise - akin to us humans and having a balanced meal. Treats do not constitute as a main meal. If the dog is eating poorly and is not receiving proper nutrients, surely the immune system will be compromised as well, no? And same thing with exercise. Even if the dog is receiving the best meal but lack of exercise, it does not promote good digestive system. Exercise is of utmost importance to dogs. It promotes good health, improves digestive system and simply... it keeps them very happy. We, the humans, can clean up their mess after a nice excursion but we cannot deprive them of their much-needed work-outs. Dog training and socialization is NOT about becoming 'celebrity' dog(s) or for show reason. Simple sit, down, stay go a very long way as it teaches the dog self-control and can help with anxiety. Training helps promote mental stability but application of training solely in indoor environment is insufficient. It has to be translated outdoors too. Teaching tricks... well, that's just to spice things up a little, make dogs 'think' and it helps build the bond between human-and-dog too. But I am not saying I'm 100% disbelieving in dogs having allergies. I do believe that pets, like humans, can suffer from allergies. But the number of cases presented these days is quite extraordinary. Let me put it this way, say if I have a hyperallergic dog/cat, I would want to know what it's allergic to which means running one of those spectrum allergy test. Knowing the result may not change its allergy but helps with the management. BUT! Before I fork out hundreds of dollars to diagnose, I am certain the my pets core lifestyle requirements are sound so whatever test I decide to run is a valid. Nothing beats good old fashion care and management to boost the immune system. Or MAAAYYYBBBEEEEE.... I'm just lucky.... again. When the daddy and I first started dating, he told me, "Pebbles is allergic to chicken". She had horrendous eating habits which pissed the hell out of me but since the daddy and I just started dating, I 'pan-chan' (give way). I switched the boys to Wellness Core Ocean to suit her "allergy". No difference. Then I switched them all to the "Simple" formula which is supposed to be of limited ingredients for 'food sensitivities'. Still no difference. Then time passed and I got fed up. I do not tolerate crappy eating habits for too long. So I told HER daddy, "Your daughter will first become a kampong chicken then she will fatten up. I don't care. I am changing her eating habits." So Pebbles started on my eating-reform boot camp. No more pan-chan. I could not imagine her continuing another decade of her life eating so poorly and consistently plagued by skin problem. It did not take me two weeks to get her to start eating properly and stop taking food for granted. Yes, she did lose weight in the first month but once she started to eat like a normal dog, she gradually gained back her weight and her frame became sturdier too. Then with increased activities as well, her skin problem got better too. AND! I eventually switched everyone one back on the Wellness Core Original - the chicken one. The one that she is supposedly 'allergic' to. And she was doing very well for a long time UNTIL her daddy started to neglect her much-needed exercise for an extended period of time, then her skin problem started surfacing again. Question 7: You don't home-cook for them? You want to try cooking for the two big ones? It's comparable to cooking for an army. i-laugh-loud-loud. I'm lazy. Period. These dog foods are formulated to be balanced diet and I don't have to count calories or worry about the feeding portion. I just feed. These days with all crazy phenomenon of "holistic diet", "protein-focussed diet", "added value", "added everything"... and there are so many more brands available now! I don't even shop at pet shops anymore. I get a migraine looking at the variety. I stick by that one brand and that's that. And yes, I've read all that slamming about commercial dog food and - *in dramatic voice and gestures* - it causes cancer and the dogs to die. And... it is not cheap to do home cooked. I did a rough calculation in my head - that was not even me getting down to the nitty gritty of the actual ingredients I should be plonking in to ensure a balance diet. It was a 'one-day-make-do-balanced-diet' according to Flapper's mummy. So that was that. I pledged allegiance to the dry dog food thereafter. Perhaps if I have a teeny tiny dog who eats like an ant, I may consider the home-cooked option. But with 2 1/3 dog plus 2 cats, I prefer hassle-free. Besides, I use these kibbles for training too. I'm a kiam-siap (stingy) mama. *laugh* I use kibbles to train. It's very convenient. One kibble is one kibble. And I always say. If one can train using kibbles, imagine what one can do with chicken, pork, beef and lamb? Behind-the-scenes at Flapper's latest filming project. That waist pouch I'm wearing... that's a pouch full of kibbles. Now you know the secret! Ha! So yes, when I need 'treats' of higher value during Flapper's filming for trickier scenes, I would quick boil some chicken or beef or for the ultimate one... LIVER! I rarely buy treats off the shelf... unless given. I gravitate towards using the 'real meats' when I need higher-value food/treats. Question 8: What's your take on home-cooked food? Absolutely nothing against it. If owners are willing to spend all that time and effort to cook, go forth and conquer. After all, nothing beats fresh human food right? HOWEVER, the flip side to this is that owners have to do research on what is considered a balance diet. It is not just about popping in a gazillion supplements to make up for the "missing nutrients". They really have to research into using the right ingredients AND do calorie counting to ensure the portion given is correct. And that is why I favour feeding dog food. One kibble is compressed with all the blahs blahs inside. Each boy takes about 3 cups per day of dry dog food. Does this equate to 3 cups of home-cooked food? No. It will probably be way more than that. And do I look like I really want to sit down and count calories? I don't even count my own calories! So.... I cannot stress enough - nutritionally balanced based on scientific research, not what the human thinks is balanced. Question 9: What about those raw/barf diet? If I strike Toto, maybe. But first, I must get a humongous freezer. In a nutshell, I really have nothing again home-cooked or raw or barf... or whatever is the trendy feeding of the season. Each has their own benefits. I just prefer sticking to kibbles. Question 10: What about supplements? Do you give them supplements? Ahhhhhh... supplements! I have nothing against supplements. I know it has its advantages. But does this mean I am going to throw every damn 'flavour of the month' supplement according to Dr Google? Hell, no. I am paying good money for their dog food = it should be of good quality = quality ingredients and nutritionally balanced. In fact, with this new-age world of dog food, most of the dog food has added supplements inside. Some may argue that it's "insufficient" but based on today's dog care trend, when is enough... enough? I have even heard someone claiming that 'supplements are bad'. I tried to probe further to understand his take but his "professional secret" such that he remained tight-lipped. My point is, for every one Dr Google says, there will be conflicting points of view. I tend to stick to good ol' fashion - give only when necessary or when advised by your vet and give in moderation - theory rather than just throw a buffet of supplements just because 'everyone says it's good for the dog'. Does this mean my dogs are not on any supplement? No. Flapper is on Tricosamine for his notoriously bad hips while Pebbles is on Probiotics for her skin. Frodo... he looks so cute when I give Flapper his Tricosamine - it's in treat form so the boys love it - so I 'blan-jah" (treat) him Flapper's Tricosamine now and again. This title series of articles was actually inspired none other by Wellness Pet Food itself. This sponsorship by Silversky was one that was hard-fought battle. It only took me FOUR attempts in three years before I got that long-awaited 'YES'. Another brand approached Flapper recently about 'testing' the food and then writing a review. My stand, when it comes to sponsorship for Flapper, is very clear. It is NOT about getting the freebies but it has to a brand that we have tried, tested and trust. Flapper is NOT a brand whore. Period. I went to research into that brand and well, not a bad food I must say. It's been around for some 30 years but only most recently did someone decide to bring it into Singapore. I spoke to the representative about long-term sponsorship instead of a once-off freebie bag and it was agreeable. However, I was still very reluctant to just switch the kiddos over to a new brand and mulled over it for a long time. One thing for sure, I could not credit the new brand for Flapper's well-being and health status. The most I could review was perhaps on the the pretty impressive ingredients? I do not advocate writing reviews just for the sake of writing it. I write it because I truly believe in it. You see, Flapper has been on Wellness since.... I cannot remember it was 2007/8/9. Let's just say... forever. Wellness emerged into Singapore market in 2007. I remember during that time he was on another brand of food but as there was a bit of problem with the supply (as in difficult to get stock), I decided to switch to another brand. I heard a bit about Wellness and "research" into it. During that 'era', more of these holistic, grain-free, protein-focussed and "the first ingredient should be whole ingredient i.e. chicken is chicken, not chicken by-product or chicken meal" dog food started to be the 'big thing' in dog feeding. I was more into the idea of "the first ingredient" part just because... it is a tempting idea that Flapper gets the solid meat ingredient listed. The grain-free part... I was not all that bothered. The list of other ingredients looked pretty impressive too. There's like broccoli, carrots, apples, blueberries, kale, sweet potatoes.... then there's the added goodies of ground flaxseed, salmon oil, herb extracts (rosemary, green tea, spearmind), glucosamine, probiotics... pretty comprehensive list of ingredients besides the core meats. Chicken and Chicken Liver.... LIVER! Uncle WILL love it. 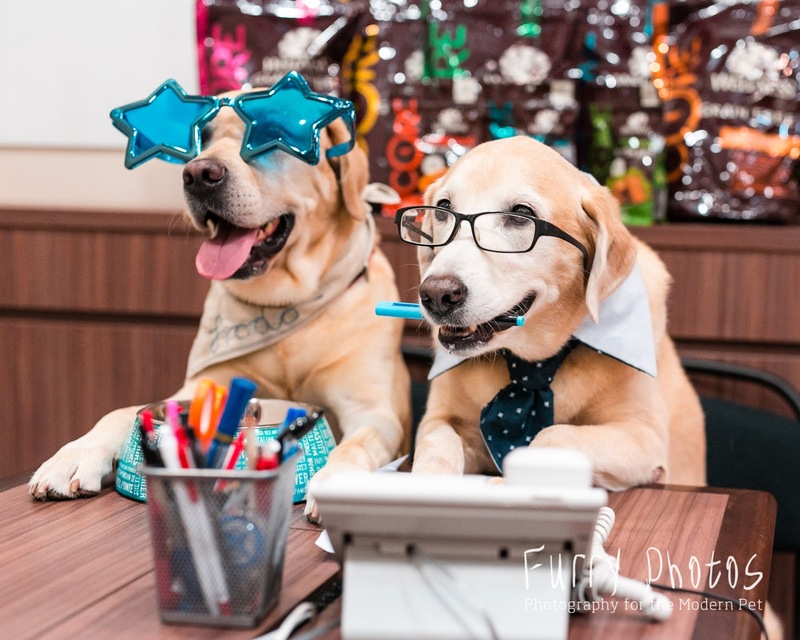 But like many dog owners who regards Dog Food Advisor as the bible of dog food reviews and analysis, of course I had to go snoop to see what Wellness dog food's ratings and reviews. Wellness Core Original sat (still sits) proudly in the 5-star category. I did a couple of comparisons with other brands before making that final decision. During that time, there were quite a few brands starting to emerge but not as insane as now. So brands like Wellness, Orijens and Acana were considered the "Mercedes Benz of dog food" - THEN. But these days, with so many more 'atas' (high class) variety boasting of so many more holistic properties and god knows what and what and what, Wellness Core is probably now more Toyota? Mid-ranged price but fuel economy and reliable? Haha! Wellness itself has also started the Trufood range which I had a quick peek at the prices and was like... Wah! Rolls Royce ah? Okay, maybe Mini Cooper. Nevermind, I'll stick to my trustworthy 'Toyota'. So Wellness Core Original, it was! 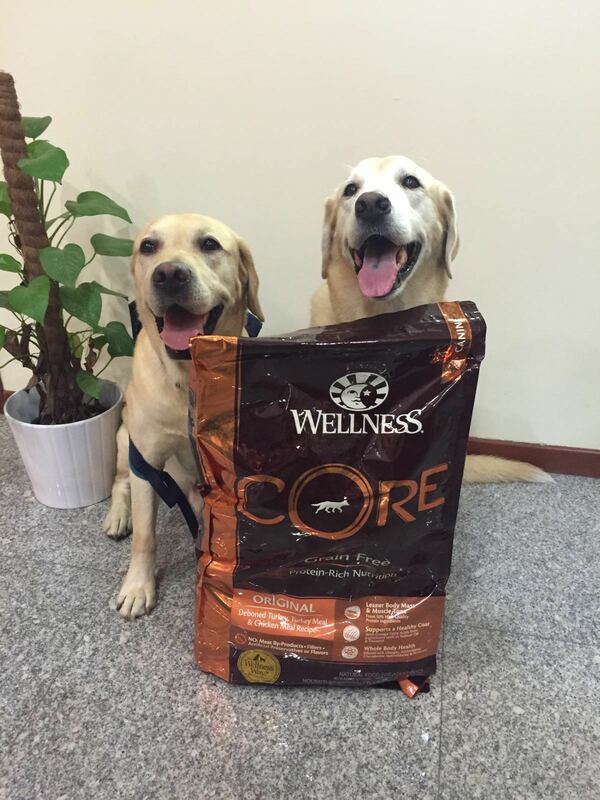 I still remember vividly when I received that first bag of Wellness Core, I opened it up and LOVED the smell of the food. Call me insane but I think the food smells like bah-hu (pork floss)! The kibbles looked fresh too - you know, for anyone who has experienced some other kibbles where you can actually see how 'oily' each kibble is. The inside of the bag looks and feels oily plus the food smells funky too. In addition, I loved that the packaging was well thought out. Sturdy plastic with 'ziplock' closure. Mind you, during that time, most food were still in those paper bag type packing and no self-closures which meant re-packing required. So yep! After receiving that first bag of Wellness, I knew I made a good choice and there was no turning back. And Flapper has pretty much stuck to it except that one year when another brand sponsored and I truly did want to try Flapper on senior diet. And yes, they rejected Flapper then as well before I took up that sponsorship. Ha! Our lifetime worth of rejection from Silversky. But once that sponsorship year was up, I switched Flapper and co. back to Wellness. To date, Flapper has been on Wellness for 7-8 years, the cats 6 years, Frodo 4 years and Pebbles 2 years. For the history the kiddos have with Wellness, you can well understand why I place such high priority for this particular sponsorship. I will adamantly (and stubbornly) say it again. 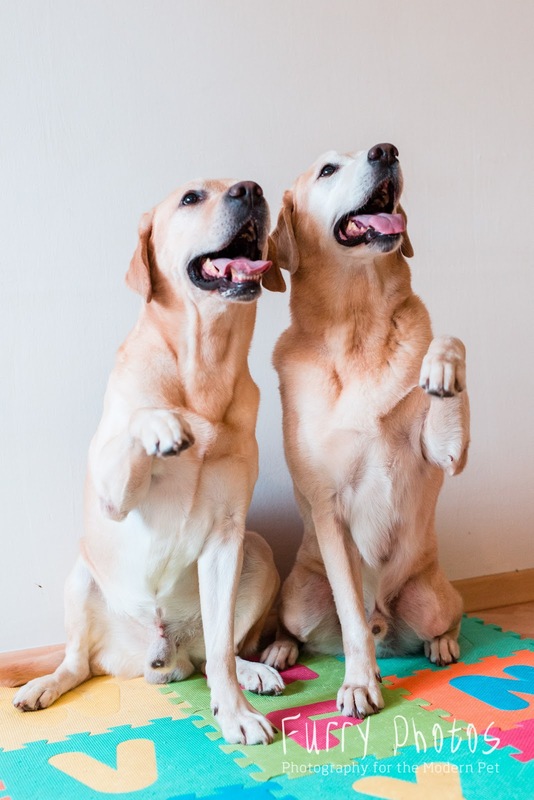 For Flapper and/or Frodo to be a 'paw-bassador', it has to be a product we strongly believe in. It is a matter of ethics. And Flapper is not a brand-whore. I do not want to frivolously recommend every dang product that means nothing to us and adds no value to some other dogs. It is not sponsorship for the sake of sponsorship but we stand for the brand/product we represent. And for what it's worth, it's not what most people think that akin to human ambassadors, sponsorship comes with ker-ching $$$$. So please stop asking that damn question about the ker-ching. So... that should probably scream loud and clear that whatever review Flapper or I do, we do not receive monetary incentive. We do it because we want to and we believe in the product. This also means Flapper (and Frodo) ends up representing very few products. Ha! So either you can love Flapper Mummy's, aka moi, for her ethics or hate her for the very same reason. "Why won't they (Silversky) just sponsor Flapper? ", I kept thinking grudgingly. Trust me, after three rejections, the thought of re-approaching them one more time was daunting. Just seems so.... desperate. Ha! Anyway, not willing to just let it go, I decided to approach them ONE LAST TIME. If this time still cannot, then sudah! That's that. The end. "Flapper, you go write to Silversky and tell them why they must sponsor you... and Frodo." And Uncle Flapper wrote some two to three pages long email to explain quite blatantly WHY they should, after all this time, sponsor not just him but Frodo as well. After all this time, Silversky finally agreed to sponsor not just Flapper but Frodo as well. I could not be happier. The many years of pursuit was worth it just because... as a pawrent, I know that the boys are secured with their trusted brand of food. On this note, I just need to reiterate that my highly-favoured preference for Wellness Pet Food is based on personal experience and NOT because the boys are getting sponsored by them. 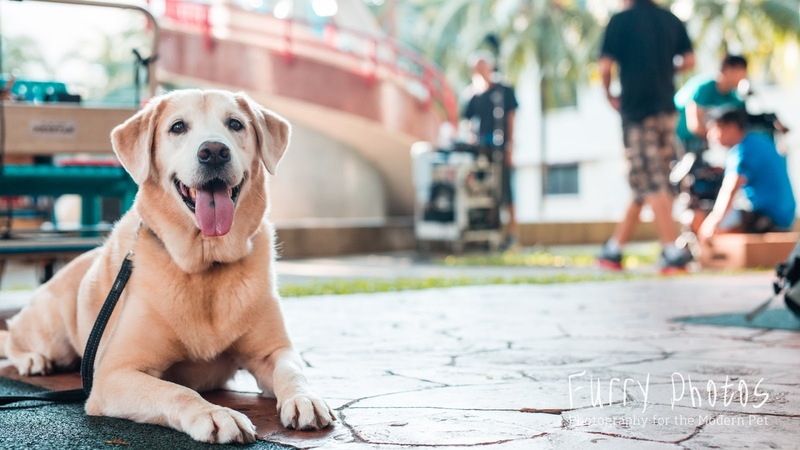 7-8 years on the food and with Flapper's recent Health Screening results, I think that speaks volume and I do not need to write some lengthy review on Wellness Pet Food ingredients and how good it is. Touchwood but both the cats and dogs have pretty much been trouble free, health-wise. Some people may beg to differ and have different experience with the food. As I mentioned very early on in this article that pet feeding can be very controversial and subjective. My review is based on what works for my pets.... and of course, me. I sincerely have nothing against owners and their preferred choice of feeding. It boils back down to what works for the pet(s) and owner(s). After all this time of pursuit for 'Wellness', surely it would be a monumental to do an "official contact signing" session, no? It is very important that the sponsors/collaborators share the same spontaneous spirit and are willing to share our sense of fun. As I always say, when you work with animals, you need to have a sense of humour. On a more serious note, the projects that I undertake involving the dogs have to spread a healthy and some times (although I wish all the time) meaningful messages about dog ownership. As I finally draw to a close on this three part series, Flapper and Frodo's real life pursuit of wellness continues. My journey with them painstakingly continues. Even though I am a self-declared lazy mama, but that pursuit of their overall well-being is not part of the 'lazy' package. Uncle loves working and being on set.... and well, as I always say, our treasured mother-and-son time together. As long as he is healthy and mobile, I will happily indulge Uncle in different activities and experiences. Keeping my old man young at heart. And with this... I am so happy to hand the keyboard back to the boys! 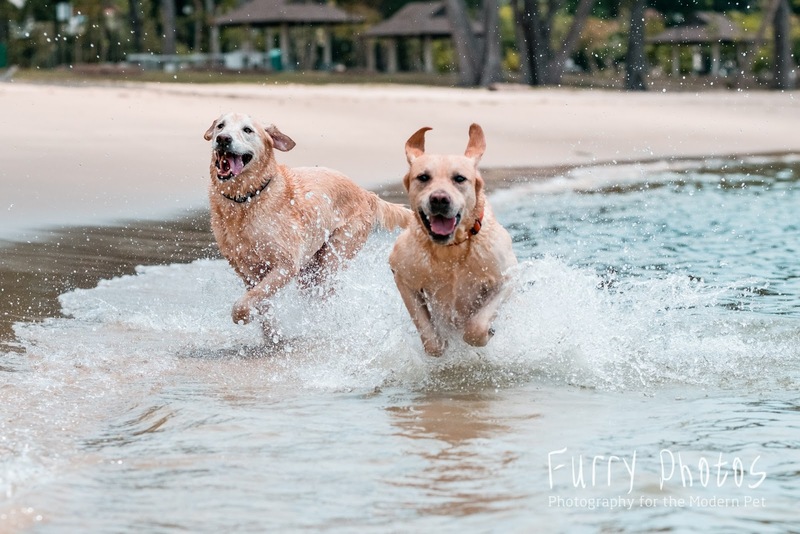 Throwback to Flapper's exhilarating 9th birthday celebration at St John's Island last year. 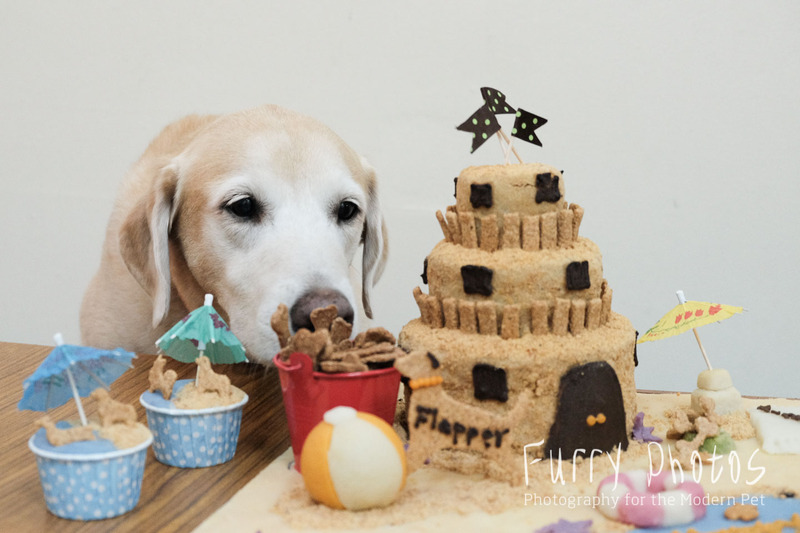 Rumour has it, SGBarkery has already designed his cake for his 10th birthday! Till more exciting updates from the boys.... here is Flapper's mummy signing off.